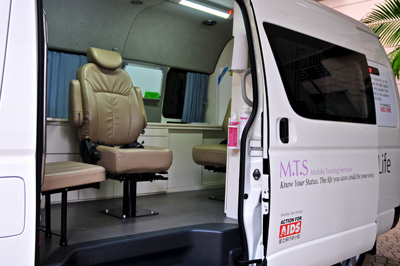 Out of 20 onlookers, only six could recognise – from a distance – the Action for Aids’ Mobile HIV Testing and Counselling Service van, which first started in 2011. But little does anyone know that the service has seen nearly 2,000 clients in the last year. AFA revealed to The Independent Singapore that most of them are between the ages of 20 and 39. Gay men made up the bulk of its clients last year. However, the number people who are HIV positive is almost the same between homosexuals and heterosexuals. Six homosexuals and five heterosexuals have tested positive for HIV at the mobile testing van, among 898 homosexual and 770 heterosexual clients. AFA also offers peer support groups and financial assistance to buy HIV medication, said the spokesperson. The spokesperson also added that AFA has a track record for providing safe and hygienic tests at their Kelantan Lane’s clinic. According to AFA, half of HIV-positive patients were already in the late-stage of HIV infection when they were diagnosed. With the service, it hopes to promote early detection of the infection, and reduce the spread of HIV. Ministry of Health’s latest data show that there are 4,193 Singaporeans with HIV infection. The next MTS venue will be at Wallich Street/ Peck Seah Street at 5 to 8 pm today.